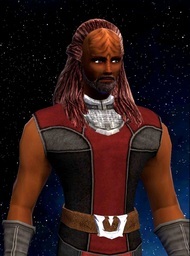 Karr had a long and distinguished Starfleet career, marred only by the occasional assassination attempts made upon him by various enemy Klingon Houses. After serving on the USS Vanguard under Captain Archer, he tried to retire to Qu’noS where he bought a tarsk farm and spent his time practicing the bat’leth. Unfortunately, his mixed heritage caused him constant discrimination, so he eventually sold his farm and bought a small tramp freighter. He has taken to being a nomad among the stars, his current whereabouts unknown.